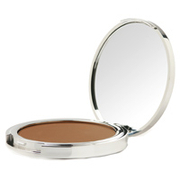 Achieve a radiant, sunkissed complexion with Laura Geller's Baked Bronze-n-Brighten, a compact bronzer that has been baked for 24 hours on terracotta tiles and hand finished in Italy. 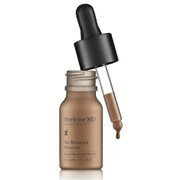 Infused with swirls of liquid pigments, the long-wearing formula glides effortlessly over skin and intelligently adjusts to your individual tone to create dewy, bronzed results. Its brightening properties leave skin with a luminous finish, and its dose of antioxidants, Centella Asiatica and White Tea Extracts help to safeguard from signs of ageing. Expect an illuminated, natural-looking tan. Housed in a mirrored compact. Free from mineral oil and parabens. 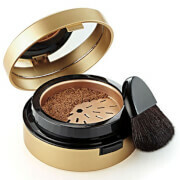 Apply bronzer on places the sun naturally hits: forehead, cheeks, nose and chin. Mica, Talc, Dimethicone, Nylon-12, Isopropyl Palmitate, Polysorbate 20, Magnesium Aluminum Silicate, Phenoxyethanol, Lauroyl Lysine, Sodium Dehydroacetate, Ethylhexyl Methoxycinnamate, Simmondsia Chinesis (Jojoba) Seed Oil, Tocopheryl Acetate, Retynyl Palmitate, BHT, Camellia Sinesis Leaf Extract, Centella Asiatica Leaf Extract, Titanium Dioxide (CI 77891), Iron Oxides (CI 77491, CI 77492, CI 77499), Carmine (CI 75470), Ultramarines (CI 77007), Red 7 Lake (CI 15850).